Can you imagine what it would be like to not just have an audience consume your content, but to crave it? Four years ago, I shared that your content must resonate with your audience so they follow you where you want to take them. 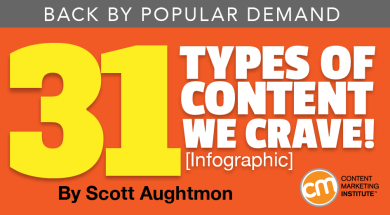 To help, I originally created a list of 21 types of content we all love to consume. Do these types of content still resonate with people? Absolutely. But other types can help marketers as well, which is why I created a follow-up infographic with additional content types. I thought a lot about other types of content we all crave. I’ve come up with another 10 powerful types. 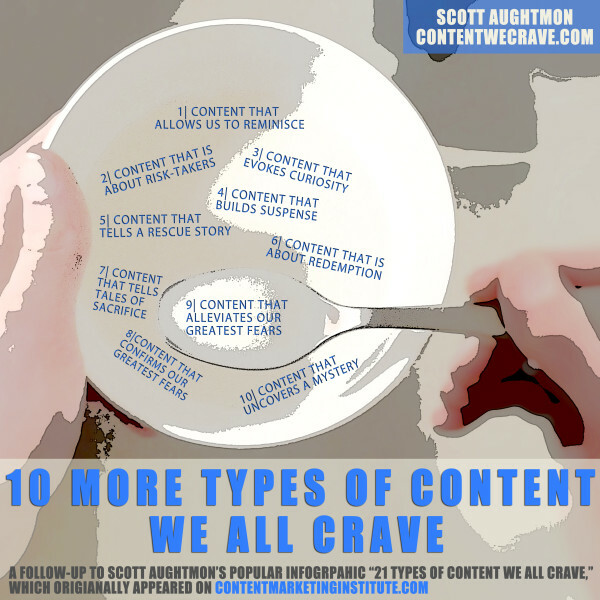 The 31 types of craveable content can be used in many ways and in many forms (stories are just one way we can harness their power). However, I will simply share the most powerful way – use them to frame your content. Use these types of content to create the lens through which your audience perceives the rest of your content. If you employ the types of content we crave, then you’ll be able to create content like you never have. It doesn’t matter whether the content is words on a screen (or paper), audio, or video. These types of content work in any and all forms. Print this list and put it somewhere you can see it regularly to help you develop irresistible content as part of your content marketing strategy. Does the content I am writing meet this criteria? What can I do to make the content I’m creating fall under this category? What types of craveable content do you use that isn’t on the list? Share in the comments along with your examples of content you crave. Looking for more insight on creating craveable content? CMI’s 2016 Content Marketing Playbook has tips, insights, and ideas that can help increase your success with 24 of the top content marketing tactics.